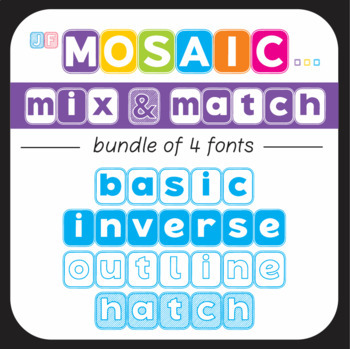 These JF Mosaic fonts can be combined to produce ‘mix and match’ effects within your projects (see preview or thumbnail images above). Each of the fonts includes upper and lower case letters and digits (0-9), along with a range of punctuation, mathematical symbols, as well as accented letters and additional symbols for Spanish, French, Italian, German, Swedish, Danish, Norwegian and Maori. Please download the preview document to see included letters and symbols. To install, unzip the download, double click on each True Type Font file to open, then click on the ‘install’ button for each font. After installing, your new fonts will be listed amongst the other fonts on your computer, appearing as: JFMosaicBasic, JFMosaicHatch, JFMosaicInverse, JFMosaic Outline. 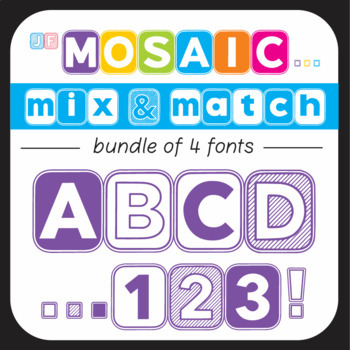 All the Collections listed above, as well as The Mosaic Mix & Match Collection, are included in The Big Growing Bundle of JacFonts available here. 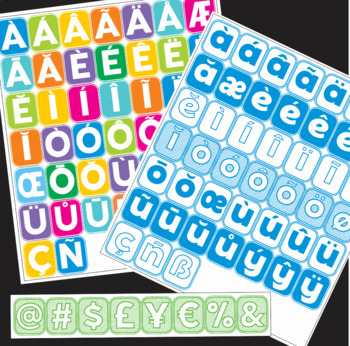 *** Many more JacFonts are available individually in my TpT store. You’re most welcome to come visit and browse through the range here.